Octel 250/350 message servers provide convenient access to voice and fax messages for organizations with large messaging communities or high traffic levels, helping employees collaborate to make better decisions faster and helping to provide superior customer service. The Octel 250/350 message servers offer many applications, including voice messaging, telephone answering, and fax processing, which can help strengthen communications and collaboration among employees, customers, partners, and suppliers. Users can easily retrieve and send messages via any phone or PC with Web connectivity, and direct fax messages to any fax machine. Aria®, the popular telephone user interface (TUI), provides user-friendly and convenient access to a broad menu of messaging options. The Visual Desktop Messaging Suite helps user quickly and easily manage their voice and fax messages. Visual Messenger software lets users access and send messages from their desktop computers, while www.messenger lets them do the same via your Web browser. 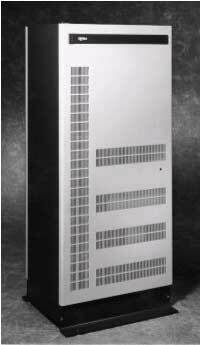 With a maximum of 72 ports, the Octel 250 message server supports up to 945 hours of storage and 15,000 mailboxes. The Octel 350 message server has a maximum of 144 ports and supports up to 1,350 hours of storage and 30,000 mailboxes. The Octel 350 message server contains all the features of the Octel 250 message server, as well as two levels of redundancy, for simultaneous storage of data or voice information on two drives. Standard Octel 350 reliability facilitates continued operation of critical applications. Redundant copies of operating software, prompts, application software, and database are contained on each of the server drives (drives 0 and 1). Redundancy allows the server to continue operating even if a single drive fails. The Octel 350 also offers global message redundancy as a standard feature, providing automatic simultaneous duplication of every message, name, and greeting on two separate drives. Standby redundancy provides a redundant system CPU and file cards on a second cabinet; this is an optional level of redundancy that you can purchase. Copyright © Tel-IS, All Rights Reserved.